One of my images of sweet baby Skye will be gracing the COVER of this new and exciting coffee table book. Three of my images were also chosen to be on the inset of the back cover. Open up and see 32 of my images gracing the pages within. ( woo hoo! ) I will have a list of all babies who were chosen soon! 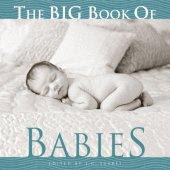 The Big Book of Babies is a 384-page collection of more than 230 black-and-white photographs--printed in duotone--that capture the wonder and excitement of babies' first years. J.C. Suares is a designer of books, magazines, and newspapers, presently working with clients including Inc. magazine, Fast Company, Variety, and Publishers Weekly. He has edited and designed The Big Book of Dogs, The Big Book of Cats, and The Big Book of Horses, as well as Funny Babies, a hilarious and charming collection of photographs. WOO HOO!!! I am so proud! Next is a book on all my work! What a nice accomplishment! Very exciting :) I would love to see some of your recent work! Your photographs have always inspired me. Congratulations! I can't wait to order a copy!!!! That's so great!! I can't wait to get a copy! !